Your flat fee listing includes complete representation by a local real estate agent who will look out for your best interest during the entire process. You will be advised and guided on home pricing strategy, getting the property ready for marketing, repairs, staging and more. 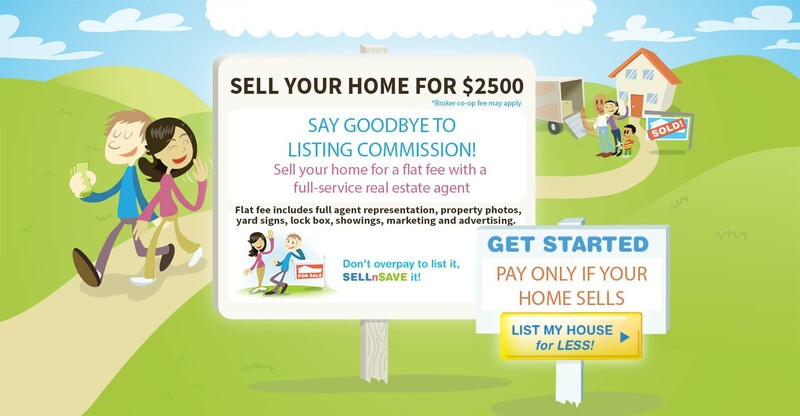 Real estate listing syndication is very important factor in selling your home since most home buyers are spending more and more time looking at homes online than any other medium. Your home will be listed in the MLS and syndicated to hundreds of other real estate websites including Realtor.com, Zillow, Trulia. Sellers need feedback during the marketing period. For every showing that does not produce a sale — the seller should know the reasons why the buyer decided not to make an offer and make necessary changes to speed the sale of the listing. Your agent will handle all showings and provide feedback after each showing. Setting the right price from the start is among the most important steps toward successfully selling your home. This requires taking a close look at what other houses are selling for to judge the relative value of your home. No matter how priceless your remodeled kitchen or finished basement are, the market sets a value—the price a buyer is willing to pay. Your agent will compare your house to others on the market and will provide you a fair comparative market analysis along with a suggest list and sell price. Lockbox allows other agents to show your property while providing top security and complete records of the access. Lockbox and yard sign is included with your full service listing and will be installed by your agent when putting the house on the market. Sellers used to count on curb appeal to make a good first impression on potential buyers. Now, with 80 percent of home buyers starting their house hunting online, a home’s “pix appeal,” or how good it looks in photos posted on the internet, is taking over as the top way to impress buyers off the bat. Your agent will take plenty of photos of your home and will place it in the MLS for home buyers to see. All paperwork will be handled by your agent to ensure compliance with federal and state laws. Your agent will also review all offers, help with the contract negotiations and closing related documents. A seller needs to know what is going on with the sale of their home. Your agent will regularly update you on the marketing, feedback from showings and about anything else that may concern the home sale process. Selling a house involves a lot of work. There are so many little details that must be taken care of before all parties can close on a transaction. Your agent will take care of all the loose ends to make sure your home closes on time. LIST MY HOUSE FOR LESS! SYNDICATION: If the buyer doesn’t see it, you won’t sell it! Ultimately, the decision of how much to pay your agent is yours, but you should always feel that you get your money’s worth. 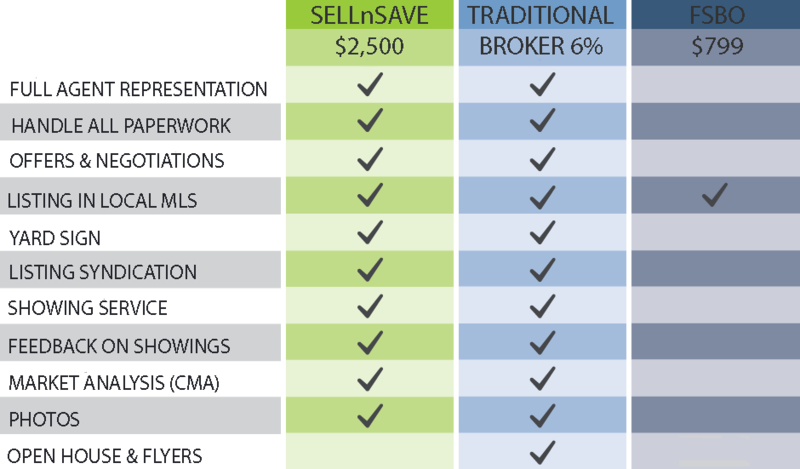 At SELLnSAVE.com, we match you with a local experienced agent who for a flat fee will provide same service and representation that a traditional broker would. Best of all, there’s no cost to you if you do not sell your home! We used SELLnSAVE.com to list our home as we had very little equity in our home and needed whatever we could save for our next home down payment. They assigned a local agent to us who was extremely knowledgable in our area and delivered exceptional service in selling our home for top dollars in a very short time. Thank you for all your help! Thank you for providing such a great value and platform for home sellers. I listed my house with your referred agent and sold it for full asking price within weeks! There was nothing different in service or value from the agent in the entire transaction except I paid $9,500 less in commissions at the closing table! Thank you! This has been the easiest selling experience I have ever had! They connected with a local agent who was very knowledgeable and professional. Our home was on the MLS within 2 days and sold within a month. Highly recommended! You guys are great! Thank you for helping us sell our home and saving us ton of money! 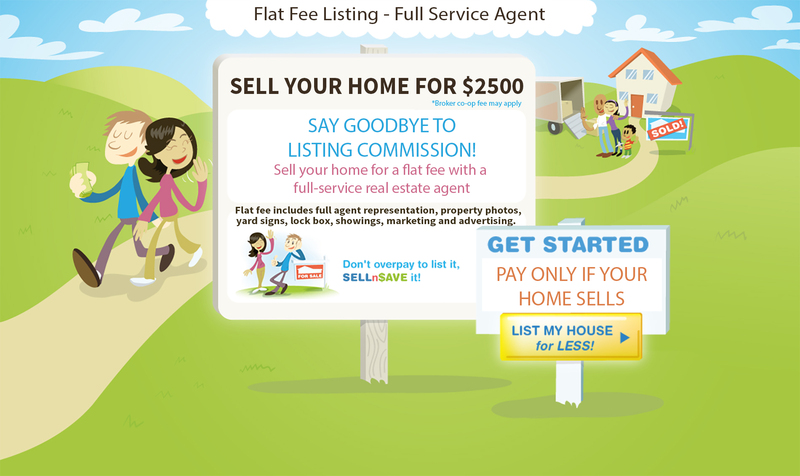 I really enjoyed the experience with SELLnSAVE.com and our agent Kelsie. Our agent was very experienced with the local market and provided a market analysis so we knew what our competition was. He also provided helpful information on staging and getting some of the repairs done on the home before listing it. We had 12 showings within first week and worked out a contract right away with the help of our agent. I would highly recommend them if you are looking to save some money! I was happy to use SELLnSAVE.com to list my home. They connected me with a local agent who provided exceptional service! I listed my house on a Friday and had 2 offers by Sunday. I will definitely refer you guys to my friends and neighbors! I would definitely recommend SELLnSAVE.com. Our agent was very helpful and the selling process was easy. We saved at least nine thousand in commissions! I received multiple offers within first week. Asking was 149K and under contract for $152K! My agent was great and always there to answer any questions we had. Our selling process is very simple! Once you signup, we connect you with a local real estate agent in your area, who will reach out and make an appointment to go over the paperwork and pricing strategy with you. Your agent will also provide a yard sign, lockbox and take pictures of your home to place it in the MLS. Once your home is in the MLS, your agent will coordinate all showings and obtain any feedback for you from other agents or buyers. Your agent will also oversee the entire process from listing to close including paperwork, offers review, contract negotiations and everything in between! No other hidden fees or surprises! ARE YOU AN EXPERIENCED AGENT LOOKING TO JOIN OUR ONLINE REFERRAL PLATFORM? 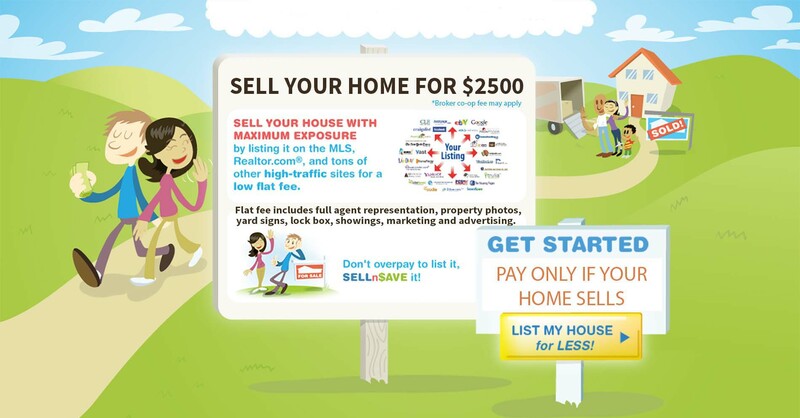 SELLnSAVE.com is an online real estate platform bringing you discounted real estate services without sacrificing any services. Our goal is to use technology and connect consumers with trusted, experienced agents to help buy and sell real estate locally. We have 100’s of independent agents across the country ready to help achieve this goal and will offer the same level of service and experience as any traditional broker would without charging ridiculously high commission rates of 6 to 7% to sell your home.